This was one of his usual jokes. When Félicité came calling, he assumed her affectations. It was no good Marthe saying they were fine where they were, she and her mother were obliged to follow him into the drawing room. There he took enormous pains opening the shutters, arranging the armchairs. The drawing room was never used and its windows remained closed more often than not; it was a large unused room, in which stood furniture with white covers yellowed by the damp from the garden. Félicité kissed Marthe on the forehead and then gave her hand to Mouret. She and her son-in-law generally affected a mocking tone in their conversations together. ‘It’s very nice and polite of you to say that!’ exclaimed Félicité, whose eyes were beginning to glisten. This was one of his usual pleasantries. He affected all Félicité’s fine airs whenever he received a visit from her. It was to no purpose that Marthe protested that they were very comfortable where they were; her husband insisted that she and her mother should follow him into the drawing-room. When they got there, he bustled about, opening the shutters and drawing out the chairs. The drawing-room, which was seldom entered, and the shutters of which were generally kept closed, was a great wilderness of a room, with furniture swathed in white dust-covers which were turning yellow from the proximity of the damp garden. It makes a big difference, doesn’t it? Direct from Oxford University Press and good bookshops everywhere. Cross-posted at Lisa Hill’s blog as part of the Zola Project at ANZ LitLovers. What a contrast between The Conquest of Plassans is with The Dream! 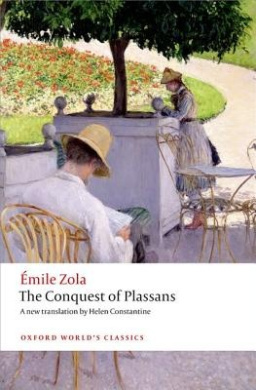 The Conquest of Plassans (La Conquête de Plassans) was first published in 1874, the fourth novel completed in Zola’s great Rougon-Macquart cycle. But if you are reading in the recommended reading order as I am, it is No 6, and comes after The Dream (Le Rêve) which was not written until 1888 and was a complete departure in Zola’s style. (See my review). With The Conquest of Plassans, we are back in the seedy world of political intrigue, greed, opportunism and gullibility. 19th century French politics are as mystifying as ever in The Conquest of Plassans but all you really need to know is that the town of Plassans has returned the ‘wrong’ candidate. As we know in Australia, marginal seats swing to-and-fro, but there is Serious Dismay if a party loses a seat that is ‘theirs’ by long-standing tradition. You can bet that the Liberal Party has a major campaign already underway to retrieve the seat that Sophie Mirabella lost at the 2013 election, and you can bet that the Labor Party hasn’t given up on the seat that the Greens snaffled in inner city Melbourne either. Well, in Plassans the party of the Empire under Napoleon III wants its seat back, and they have a suitably Machiavellian plan to achieve that. The two royalist opposition parties (the Legitimists and the Orleanists) have their champions, who live either side of François Mouret. When the story opens, Mouret lives in reasonable contentment with his wife Marthe and their three children, Octave, Serge, and Désirée. Mouret is an irascible, unstable fellow as befits his dubious Macquart heritage, and he enjoys himself bullying Marthe and baiting his mother-in-law Félicité (see my Sensational Snippet), , but it is not until the arrival of the Abbé Faujas that his propensity for malicious gossip arises. An opportunist who seizes a chance to make more money, Mouret has agreed to let the second floor of his large house to the Abbé, but he is not best pleased when the Abbé turns up early and reveals himself to be a secretive fellow who keeps himself to himself. Mouret’s attempts to find out the Abbé’s antecedents and purposes consist mainly of haranguing his wife and his servant Rose into interrogating the lodger and his mother Madame Faujas, while he, Mouret, makes phony declarations that he’s not interested in other people’s business. The Abbé is shabby and poor, but he has an imposing frame, and his refusal to engage with the bourgeois of Plassans makes him an object of great interest. When the entire town has decided that he’s a dubious sort, Mouret, perversely, becomes his champion. He welcomes Faujas to the warmth of his hearth, playing cards after dinner with Madame Faujas, and telling all who will listen what a great fellow the Abbé is. Fatally, his card games leave Marthe to the mercy of the Abbé, and before long, this placid homebody startles her irreligious husband by attending church, making confession – and starting up a charitable child-care organisation for at-risk children while their parents are at work! There’s a splendid cast of characters amongst the townsfolk, who are gossipy, gullible, greedy and corrupt. But it’s the unwelcome arrival of the Abbé’s unscrupulous sister Olympe and brother-in-law Trouche that’s the catalyst for the tragedy that unfolds. Consistent with Zola’s theories about heredity and temperament, Mouret succumbs to his fate, and his wife Marthe to hers. And who’s behind all these machinations? Ah, you’ll have to read the book to find out! As with others in the Oxford World’s Classics in this series, there is an excellent introduction. This one is by Patrick McGuinness, with a thoughtful note at the beginning that readers who wish to avoid spoilers should read it after finishing the book. Next up will be No 7 in the recommended reading order, Pot-Bouille (1882), and I will be reading the OUP World’s Classics edition, Pot Luck, translated by Australian Brian Nelson.